The Chromatrap® Native ChIP (N-ChIP) kit is widely proven to ensure a high yield of DNA so that samples can be analysed by multiple downstream processes. 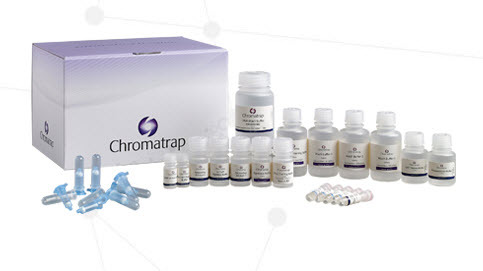 Leveraging Chromatrap®’s unique solid-state technology, the N-ChIP kit eliminates the use of magnetic or agarose beads allowing users to quickly and easily recover ready-to-use, purified chromatin for downstream applications, including mass spectroscopy. Coupling MS to ChIP will allow researchers to shed light on the proteomic landscape of the extracted chromatin enabling them to begin to understand how proteins interact with repressed and active regions of the genome and their role in global gene regulation. Chromatin immunoprecipitation (ChIP) is a technique commonly used for mapping the DNA-protein interactions in cells, which are crucial for gene regulation. The technique enriches DNA fragments to which a specific protein of interest or histone modification is bound. Enriched sites can then be identified by qPCR, hybridisation to a microarray (ChIP-on-chip), or by sequencing. This powerful tool is now being further enhanced by coupling it directly to mass spectrometry, itself an invaluable and versatile tool for the characterisation of biomolecules. In Native ChIP, the naturally occurring DNA-protein complexes are preserved in their “native” state by doing away with the need to cross-link and fix cells prior to extraction. Although there are a number of published protocols outlining methods for performing N-ChIP, Chromatrap uniquely offers researchers an efficient kit with an optimized protocol specific to this technique.